Man-made toxins tend to compartmentalize in body compartments and will reach a certain threshold of toxicity. Because of that your immune system is not functioning optimally anymore and you have microbial growth in that area. These become the areas where the microbes live, whether it’s Bartonella, Lyme, Babesia or herpes viruses. It becomes difficult because you can no longer distinguish between the toxicity and the infection. Retroviruses are immune-disturbing. Some aspects of the immune system can be upregulated, others are downregulated. That makes us hugely vulnerable for Lyme’s, mycoplasma and Bartonella and Detoxification is an absolute necessity on a regular basis. Toxins can be either water or fat soluble. Two major water-soluble toxins are the vaccine preservative thimerosal (mercury) and the herbicide glyphosate. They tend to be accumulated in areas such as the kidneys, lungs and bones. Examples of fat-soluble toxins are benzene derivatives, insecticides, pesticides and also herbicides. They like to accumulate in the fatty tissue and that makes them potent neurotoxins. Because your brain is composed primarily of fat, water- and fat-soluble toxins do require differing methods of detoxification. Why is Glyphosate bad for us? 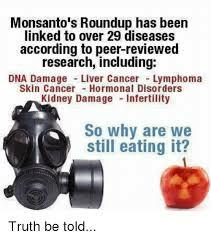 When you have glyphosate in the food, it binds all the trace minerals and they’re no longer available for absorption. It thus depletes us of all our trace minerals. Glyphosate relates to the amino acid glycine. It will attach to areas where you need glycine. Glycine is used for the detoxification process, but most of us do not have enough glycine for detoxification. To eliminate glyphosate effectively, you need to saturate your body with glycine. Recommended dosage: 4 gram of glycine powder twice a day for a few weeks and then lower the dose to 1 gram twice a day. This flushes the glyphosate out of your system and eliminate it through your urine. A long-term strategy is to take 1 gram twice a day. The best time to take it is when you are eating food that might be contaminated with glyphosate. You can monitor the urine output of glyphosate (no local test available in SA yet). It can take two to six months to get levels down then you can use a maintenance dosage. Aluminium when it gets in the extracellular space, completely changes the voltage on the cell walls — and has a profound effect on the microstructure of that matrix. It impairs the receptors that we have on the cell wall, hormone receptors, neurotransmitter receptors, insulin receptors. They all get messed up by aluminium. It has a really strong effect, stronger than any other toxin. Glyphosate is a chelating agent. It binds aluminium, takes it across the gut wall into the tissues, and distributes it widely. Aluminium toxicity causes underactive thyroid (hypothyroid), which is incredibly common these days. Aluminium in anti-acids interferes with intestinal absorption of thyroid hormones. It also has an affinity for the nervous system, and tends to collect in your brain, spinal cord and the enteric nervous system of the gut. To eliminate aluminium, you need to increase your intake of silica like using silica-rich herbs such as cilantro. Citric acid has also been shown to mobilize aluminium. An easy and inexpensive strategy is to squeeze some lemon into a bottle of water and drink it throughout the day. Apple cider vinegar is another or use magnesium malate. To eliminate fat-soluble toxins you can use a combination of sauna and binding agents such as chlorella, ecklonia cava (a brown algae), and enterous gel such as methylated silica and zeolite. One or more of these should be taken daily. When you do sauna therapy, the released toxins are then bound by these agents and will allow them to be safely eliminated rather than being reabsorbed. Many parasites and candida can absorb multiple times their body weight in toxins. The parasite load of a host is also a bioindicator for the toxicity of that host’s environment. Chronic Lyme patients are full of parasites. The Lyme spirochete will retreat into the worms, wait until you’re done with the antibiotics and then hatch back out. If you undertreat a parasite, that parasite will put out huge amounts of biotoxins that make you really sick. The larval stages of many parasites stray to the lung, and also end up in the brain. Ozonide and Rife treatment are highly effective against parasites. Rectal Ozone therapy is very effective for parasites. EMF from cell phones, modems and Wi-Fi routers can aggravate chronic disease and this exposure will exacerbate illness, including infections. Wi-Fi is destroying life on the planet. Titanium and aluminium in our system act like an antenna for the Wi-Fi. When you have an amalgam filling and you make a phone call on the side where the filling is, the speed at which mercury is evaporated from the tooth is increased multiple times to the phone user. One mobile phone call can activate the Epstein-Barr virus for many years. There’s a direct relationship between the cumulative exposure to EMF radiation and chronic illness. The more you’re exposed to EMF radiation, the more ill you can get. The combined effect of the toxicity and the EMF radiation exposure has unleased these viruses that are called human endogenous retroviruses. That can cause the severity of chronic illness. Citrus tea and broccoli sprouts are two powerful tools against retroviruses. I am really concerned about the quality of our water and food. It is contaminated not only with herbicides (like Roundup), other chemicals but also pharmaceutical drugs that is excreted in urine and eventually lands up in our water table and then is used for irrigation of our food. I strongly recommend reverse osmosis because it will take out residues of pharmaceutical drugs and glyphosate (Roundup). If you require more information about detoxification contact your integrative healthcare professional.